The ARTS are a manifestation of our creative impulse, meant to make the observer feel emotions. Think for example of the emotions you feel when you receive a drawing from your children, when you listen to a song of your favourite artist or when you visit towns such as Venice, Paris, London or Berlin. That's the reason why we have decided to create something that can help you to get in touch with the arts and finally to let you feel emotions. After all we are from Italy, the cradle of art! This project will be quite different from more traditional existing art portals because we are mainly focused upon connections between every kind of topics regarding the arts. What does "connected information" mean and why are we so interested in them? Well, every time you click a link in an internet page, you are indeed declaring your interest in a connected information. The same way, what we want to achieve through neo4Art, is to automatically discover new topics you could be interested in, by traversing art through its connections. Let us just take an example. Suppose you are planning your vacation in Paris. If you love the famous post-impressionist painter Vincent Van Gogh you probably will not miss his masterpieces from the Musée d'Orsay for no reason at all. 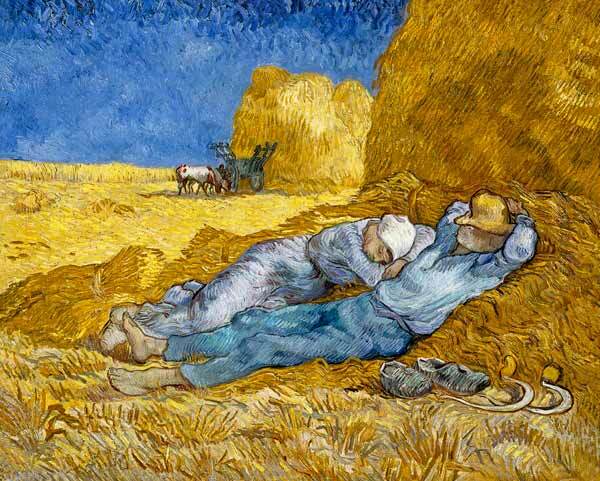 In that museum you can admire his "La Siesta". 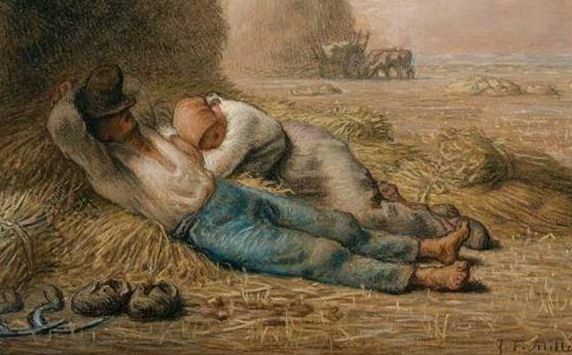 Do you know that it's a copy of one of his biggest influencers Juan-François Millet, who was indeed a realist? Do you know that the his canvas is exposed at the Boston Museum of Fine Arts? Do you know that in the same museum you can also see Millet's artwork "The Angelus", which became an obsession for the Spanish surrealist painter Salvador Dalì, who performed various re-interpretations of the same topic and also wrote an essay entitled "The tragic mith of Millet's Angelus"? Once again, while observing Gauguin's artworks, wouldn't be interesting to know that Van Gogh and Gauguin lived together in Arles? There, Gauguin painted "The painter of sunflower", which is a portrait of Van Gogh. Van Gogh insteadr painted "Paul Gaugin's armchair". Do you know that both are exposed at the Van Gogh Museum in Amsterdam as well? Those are simple examples that demonstrate how these topics are so strictly connected and how much we can learn from them. Luckily, technology can help us to do more complex analysis. We are going to implement a sentiments analysis on Van Gogh's letters to understand his mood while he was painting his artworks, and to answer the question about which paintings he realised while feeling whether happy or sad. Furthermore colour analysis can help us to understand how much the artist was influenced by Peter Paul Rubens while staying in Antwerp. Indeed, we know that he gained encouragement to broaden his palette to carmine, cobalt, and emerald green. By connecting our system to social networks, we could understand what the web is talking about. For example, if people that "like" Musée D'Orsay, as you do, also "like" Marmottan Monet Museum, we could recommend you to visit another museum that you could not know, or we could suggest you to go to Monet's house in Giverny, a few kilometres outside Paris, that is where he painted most of his masterpieces, or also the lake he built to paint his famous "Ninfee", which are currently exposed in Paris. These are all examples of what we consider connections. A really powerful tool that can help us to understand art better, by traversing it from different perspectives. The underlying technology we're going to use is neo4j, an opensource graph database, that is ideal for managing interconnected data. The amazing thing is that Neo4j works at an incredible speed! You might have already heard about graph databases, in fact social networks such as Facebook and Twitter are built on top of them in order to manage connections between you and your friends, groups that you follow and things that you "like". Neo4j is the solution that better supports our purpose of improving knowledge about art by discovering connected information. We're here also to ask for your help since we are kickstarting this great art project called neo4Art. As for Wikipedia, our project will be accessible to the community for free.